The Minnesota Department of Transportation’s New Ulm Gateway Project is replacing two bridges and constructing a new one at an interchange being built at Highways 14 and 15 and Nicollet County Road 21. The Minnesota Department of Transportation's (MnDOT) $31.4 million New Ulm Gateway Project is replacing two bridges — the Minnesota River and Front Street Bridges north of New Ulm — and constructing a new one at an interchange being built at Highways 14 and 15 and Nicollet County Road 21. It might look like a straightforward initiative, but due to soil and water conditions and proximity to the Minnesota River, it requires serious engineering to make it a success and prevent damage and closures from 100-year flood situations in the future. The work area, which is now home to crews from The Mathiowetz Construction Co., lies along Highway 14 from New Ulm to North Mankato. The project is being financed by both federal and state highway funds, and the key goals are to increase motorist safety, capacity along the corridor, and interregional trade. Preliminary work started in the fall of 2017 with some clearing and grubbing that continued throughout the winter of 2018, Major work started in April 2018. Also on the agenda are the reconstruction of an urban section of Highway 14 (Seventh Street) between Broadway and Front Street, which includes the installation of storm, sanitary, and water mains; a roundabout at the intersection of Highway 14 and Front; the raising of Highways 14 and 15 above the 100-year flood elevation; a pedestrian trail on the north side of Highway 14 from German Street to the interchange; and the removal of the existing truck station outside of town. Delivery is scheduled for fall 2019. 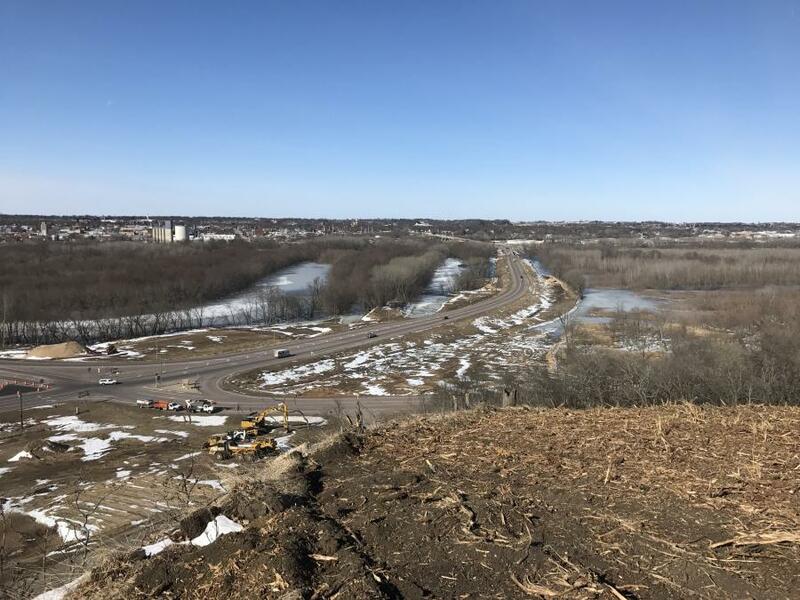 "We want to raise the road by approximately 5 feet, depending on location, and we increased the embankment width in order to accomplish that," said Todd Kjolstad, MnDOT engineering specialist and construction project supervisor. "The roadway was in pretty rough shape — it was no longer cost-effective to repair it. The intersection of TH 14 and TH 15 with CSAH 21 from the west was dangerous, where two major highways and a county road came together at the bottom of a steep grade. We changed that configuration into a bridge overpass with teardrop roundabouts on either side. Now there will be no actual crossings there, and it will be considerably safer. "The bridges were built in the 1960s, and it was getting to the point of them being structurally deficient," he added. "They weren't in any danger of collapsing. It's just that they didn't have more of the contemporary, modern guardrail systems, the width of the bridges needed to be brought to contemporary standards, and the expansion devices were not functioning as we preferred. We like to get about 50 years out of our bridges, and these had fulfilled their useful life." Initially the project was limited in scope. "There were some conversations about economic spinoffs and what we should be doing — one concern was the intersection, and we looked at some crash data and determined that it would be a great candidate to modify," said Kjolstad. "We did some redesigns and applied more money. It's not unusual for projects to start off with particular scopes and be expanded after further investigation and public input. The public, based on meetings in the last year and a half, is glad that we are upgrading the intersection. "Highway 14 is one of our major state highways, and it serves multiple roadways in the Upper Midwest," he added. "It's a major feeder road for us and a lot of towns are affected by it." The road and surrounding area were impacted by a major flood in 2010. "It seems we've been getting 100-year floods every four or five years," said Kjolstad. "While the road itself wasn't necessarily overtopped, we don't want to be in a position where that would be the case. Since this is one of the major roads into New Ulm, we decided that it should not be closed in the future due to flooding." Average daily traffic on the road and main bridge is 8,500 to 10,000 cars and trucks. The bridges were designed by HDR, and Bolton & Menk designed the drainage and grading, along with input from other firms on geotechnical issues due to the soil conditions. "Most of the challenges were related to geotechnical items," said Kjolstad. "One of the reasons the road was so poor is that subgrade is relatively unstable. In response, we are compacting the designed embankment height utilizing surcharge areas. Surcharge means to bring in between 20 to 30 feet of fill in excess of the final grade of the road. The extra weight of the surcharge material is allowed to sit on the grade and compact it naturally. When the surcharge areas have reached stability for a set period to time, the excess material is hauled away to another fill section or to the slopes. "We also had a shape array — a cable that electronically measures differentiations between the original elevations. This will stay in service in the future to indicate if any subsoils shift in the future. "If things are settling, there will be a bend in the cable," he added. "We've been able to measure that. This is a relatively new product. Usually we use settlement plates, along with a pole that has a known elevation, and as we continue to add material, we're able to measure how much settlement we get as the pole and plate sink. The surcharges are over 30 feet tall and we add three feet of height to the pole at a time and let the embankment sit for a set time period and evaluate to see if the settling has ceased." In the area where the muck or unsuitable soils were deepest, Mathiowetz was able to utilize GPS-controlled excavation equipment that registered the location of the lowest point of the excavation and verified that the unsuitable soil was completely removed. 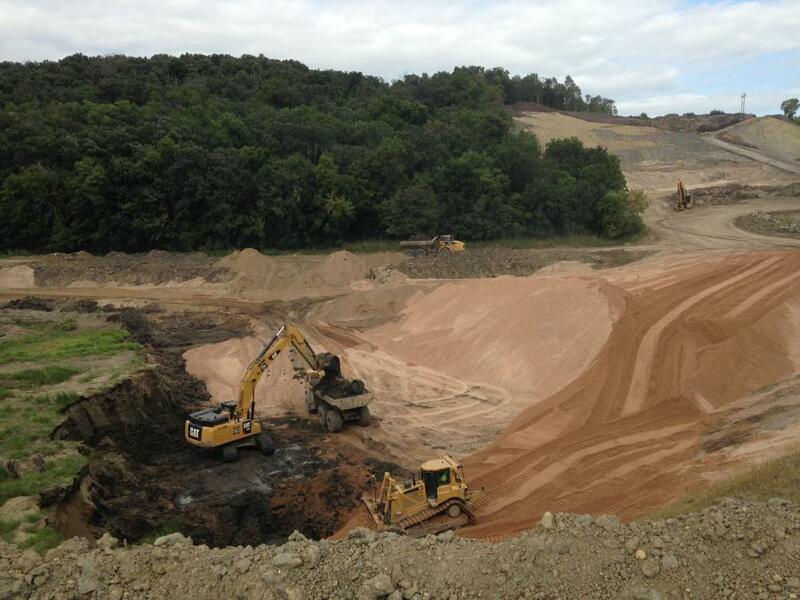 Then, using backfill equipment, crews were able to place the sand alongside the peat sidewall of the excavation in one operation with no one from either the contractors or MnDOT having to enter the deep-trench excavation. "With this application of GPS technology, we're able to literally see, in relatively real time, that the backhoe had removed material to a consistent elevation and that we're not leaving humps and unsuitable materials," Kjolstad said. "It also allowed us to have a much safer working situation. In the past, we would have a surveyor go down there and take a quick shot and get the hell out of there before it collapsed or you're underwater." MnDOT has to use this technology in swampy and boggy areas encountered in the southern part of the state, and it's looking to employ it in more projects to save money and create safer working conditions. Wick drains are being employed to speed the settlement of the deeper excavations as well. These are plastic media with geosynthetic membrane injected deep into the unsuitable material with a drill rig. The weight of the material above the drains hydrostatically forces the water up and out of the grade through a sand layer installed for this purpose. The layers installed in 4- to 5-ft. increments up to 1,000 ft. from the bridge embankment. "The water leaches out, and that speeds up the settlement through consolidation of the underlying soils," said Kjolstad. MnDOT traditionally uses spread footings, H-pile or cast-in-place piles for foundation support and this project incorporated all three. "In addition, for the river bridge, which is somewhat unique for us, we went with 4- and 6-foot-diameter shafts that were drilled down to a layer determined to be stiff enough to resist and then filled with concrete," Kjolstad said. The bridges follow standard designs, with prestressed concrete beams. The Minnesota River Bridge has two lanes, with an adjacent bike trail, and can be expanded to four lanes, and the new bridge at the interchanges is two lanes. The new road will be one lane in each direction. The traffic plan is based on diverting traffic away from the work zone, and the main diversion will be in place until the late spring. "The preference is to divert traffic," said Kjolstad. "Sometimes we don't have that luxury, but as we're replacing two bridges and a complete regrade, there was no way to leave traffic on the road. It allows the crews to do the job much quicker and haul material more safely throughout the project than if crews were working under traffic. We do have conversations with businesses and homeowners about inconveniences. People understand what has to be and that we get through this as quickly as possible." Randy Huiras, Mathiowetz Construction's project manager, appreciates the efforts of his crews and the way they are embracing the new building techniques. 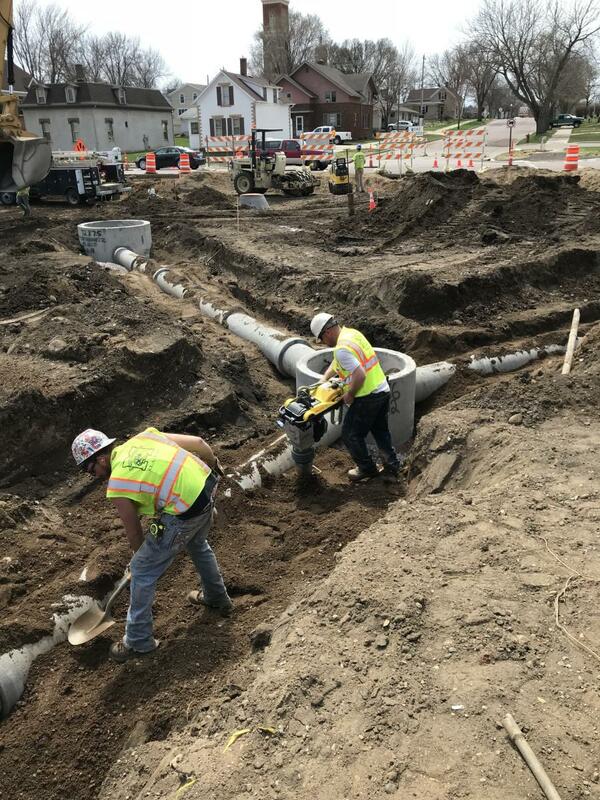 "Mathiowetz Construction and MnDOT, along with our subcontractor companies, have spent much time and effort on this job mitigating the effects of the unseasonably wet 2018 season," he said. "A project in cohesive soils like this tends to be very challenging in these conditions. 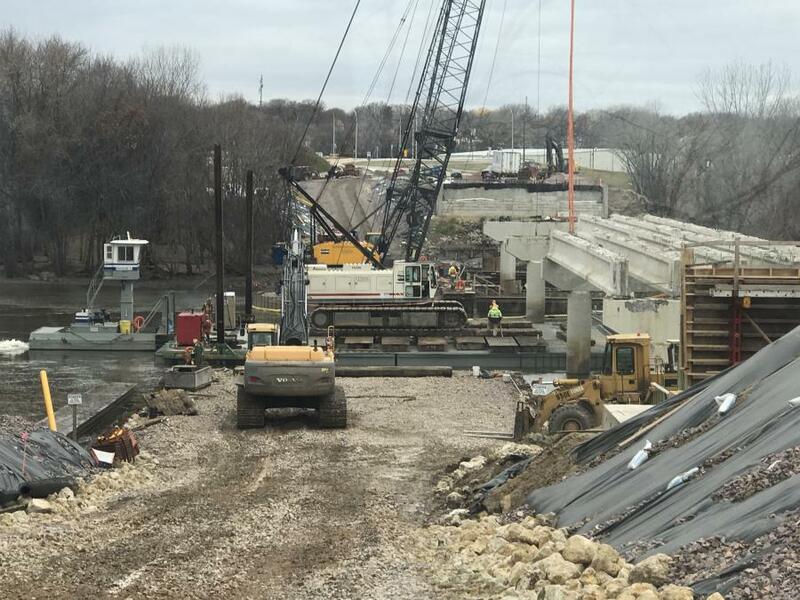 Our partnering efforts with MnDOT and the subcontractors have enabled us to continue work as much as possible even under trying conditions and we will continue to work toward the successful delivery of this project. We appreciate the dedication to teamwork that every company and MnDOT have brought to the weekly meetings and have been very successful in resolving issues early enough to minimize many of them. "We appreciate the support that more aggressive application of the GPS control in the muck area received from MnDOT," he added. "It was a great safety improvement. We look forward to continuing to look for more ways to apply GPS control to provide safer work sites." The Seventh Street section was opened to traffic on time in August. The Front Street Bridge and new RAB with Front Street was open in time for winter traffic, and most of the major grading for the new interchange is in place and done with settlement. The remainder of the work will see a focus on the completion of the river bridge through the winter and construction of the interchange bridge. The grading and reconstruction of the section of Highway 14 east of the bridge and the section of Highway 15 north of the bridge will start in May. "There will be a different traffic pattern as we start up in spring, and then the intent is for the project to open in late 2019 to traffic," said Huiras. The bridge crews have made steady progress, but the river bridge was delayed significantly by high water that did not recede enough for work to proceed until October. "These challenges have been mitigated by incorporating barges for construction," said Huiras. "So this winter, the section of river through the construction area will be kept open water to keep the barges in place. The public is cautioned to be alert to open water in the area." The roadwork began early on. Huiras is being assisted by the site supervisor Randy Shoen, who handles the day-to-day challenges. On peak days there are nearly 85 to 90 construction workers on site, including those from subcontractors such as AAA Striping, All States Paving and Reclamation, Braun Intertec, Castle Rock, PCIRoads Inc., Central Specialties, Diamond Surface Prep, Empire Pipe, Evergreen Companies, Lunda Construction Company, Warning Lites of MN, Hanson Crushing, H&R Construction, C.S. McCrossan, US Wick Drain Company, Midstate Reclamation, M.R. Paving & Excavating, O'Malley Construction, Powell Peterson Inc., Reiner Contracting, River City Electric, Simon Brick & Stone, Stonebrook Fence, Traxler Inc. and WSB Engineering. Many of these companies also have second-tier subcontractors. "The employees from these firms were introduced to the site through a site orientation video and safety training session that was offered weekly," said Huiras. The amounts of materials removed and brought in are still being determined. "The mainline concrete, bridge concrete and asphalt that have been removed on the project are all recycled on site and intended for reuse back in the project," said Shoen. "Even the trees that were removed along the river to clear for the new toe of the embankments were all recycled into mulch berms that have been reused as erosion control measures to protect this important natural resource. We were getting many calls from the public to ask if they could have some of the mulch. We had to decline as most projects today reuse as many of the removal items back into the project as possible to avoid having to import from other sources." Equipment being used includes cranes and barges on the bridges; dozers, some with GPS control and some without, mostly Cat D5s, D6s and D8s; John Deere 200 and 300 and Cat 345 and 349 excavators; John Deere 710 excavators; John Deere and Cat excavators; JD 400 articulated haul trucks; Caterpillar 627G scrapers; Caterpillar 14H and 160M motorgraders; and Cat, Sakai and Ingersoll Rand packers. The project will also include large quantities of imported aggregates and other materials that are being hauled by an extensive fleet of Freightliner and Mack truck tractor combinations. 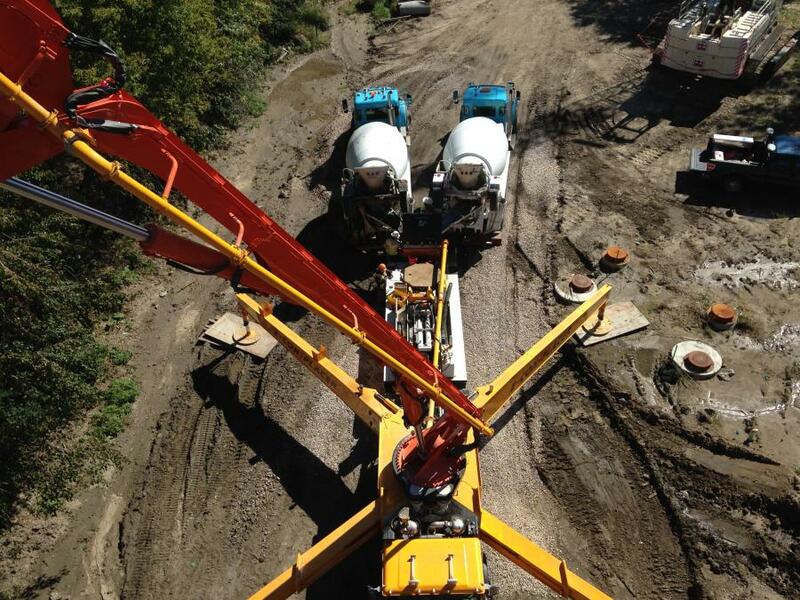 These vehicles work to bring the backfill that is required to come from distance or off site. "Projects in cohesive soils like this geographic area tend to fare slightly better than equipment in either rock or rock and sand environments," said Paul Anderson, Mathiowetz's equipment manager. "Mathiowetz has onsite mechanics that provide full service repair to any of the MCC equipment on location. Major repairs such as transmission and engine work tend to be done back at the company equipment shop. "Our onsite mechanics communicate daily with the site supervision and with the operators of the equipment to triage breakdowns on site and prioritize the repair," he added. "Most parts can arrive at the site next day thanks to great service providers such as Ziegler Caterpillar, RDO, Fleetpride, Harrison and Nuss Equipment in Minnesota among all the other companies that we partner with. If the parts are available, repairs are done as quickly as the problem can be diagnosed and the parts arrive. "The subcontractors also have their equipment teams and provide excellent uptime as well." said Anderson. Mathiowetz purchases equipment from dealerships such as Ziegler Caterpillar and RDO in Minneapolis and Harrison and Nuss Equipment in Mankato. "We really have a great relationship with these providers and find that problem solving when a piece of equipment breaks down works much faster when the dealership and the equipment owner have formed a team," said Anderson. "All of our providers do a great service to keep our fleet in tip-top shape."